It was clear something was wrong with Serena Williams from the moment she began trying to warm up for her Wimbledon doubles match Tuesday July 1. She weakly pushed volleys into the net from a couple of feet away. She whiffed on practice strokes. She even had trouble with the simple task of collecting tennis balls from the ball kids. After Williams was examined for about 10 minutes on the sideline by medical staff, including a check of her blood pressure, the match began. After three games, though, an out-of-sorts Williams and her partner, older sister Venus, stopped. The tournament referee’s office and WTA later said Serena, who lost in singles Saturday, had a viral illness. About 1 1/2 hours after leaving the court, Serena walked out of the All England Club, still wearing her white match outfit, and with a tournament towel draped around her waist. She got into a car and was driven away. They have won 13 Grand Slam doubles titles as a pair, including five at Wimbledon. In singles, the 32-year-old Serena is ranked No. 1 and owns 17 major championships, the most among active women; five came at the All England Club. 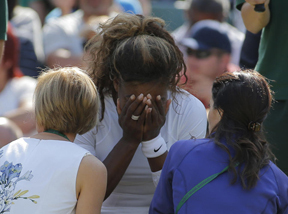 While being looked at by a doctor before the start of the second-round doubles match against Kristina Barrois and Stefanie Voegele, Serena hunched over and covered her face with her hands. During the delay, one of the Williams’ other sisters, along with Serena’s agent and her hitting partner, left their seats in the stands. Eventually, play began. With Serena serving in the third game, she was broken at love with four double-faults. One of the best servers in the women’s game, she hit balls that bounced before reaching the net. At love-40 in that game, chair umpire Kader Nouni took the unusual step of climbing down from his perch and walking over to speak to Serena. She then served another double-fault to fall behind 3-0. Serena wiped away tears as she walked toward the court’s exit. Her career has been marked by health problems. She missed eight months after having surgery on her left knee in 2003, the year she had completed a self-styled “Serena Slam” by winning four consecutive major titles. Days after winning Wimbledon in 2010, Williams cut both feet on broken glass while leaving a restaurant, leading to two operations on her right foot. Then she got clots in her lungs and needed to inject herself with a blood thinner. Those shots led to a pool of blood gathering under her stomach’s skin, requiring another hospital procedure. In all, she was off the tour for about 10 months, returning in 2011.